The new Amazon Kindle Lite app is aimed at users with limited smartphone storage and 2G/3G connectivity. Amazon has launched a lighter version of its Kindle eBook app in India. 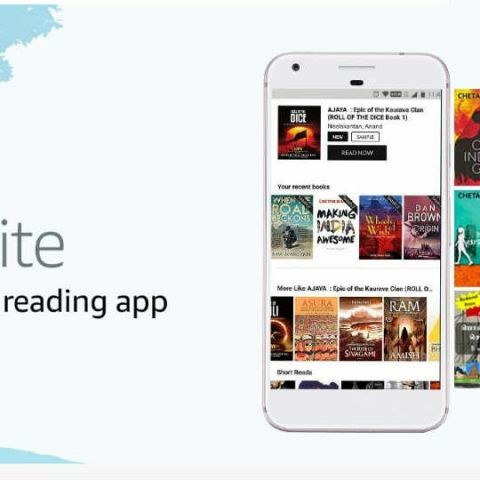 Called Kindle Lite, the app is less than 2MB in size and is aimed at Indian Android users who have limited storage on their smartphones and use 2G/3G connections. Amazon claims that the app works well for slow and patchy internet connections, like the ones found in India. Amazon new light Kindle reading app is an India first product from Amazon and includes features such as personalised recommendations, instant reading, image zoom, night-mode, Whispersync (syncing your eBooks across devices) and more. The Kindle Lite app will also come with free eBook samples and titles across English, Hindi, Tamil, Marathi, Gujarati and Malayalam. In all, 30,000 free eBooks are available to read on the new Kindle Lite app. As an introductory offer, Amazon has announced that during the first month of the launch of the Kindle Lite app, users can avail a cashback of 80 percent on their first eBook purchase if they pay for it using their Amazon Pay balance. Amazon had launched the Kindle Lite app on Google Play Store as an Open beta last year. The app also allows users to actively manage storage for downloaded eBooks as well as monitor data usage over Wi-Fi or mobile networks. With the launch of Kindle Lite, Amazon has joined the likes of Facebook and Twitter is launching India-specific lightweigh apps. The Facebook Lite app was launched in India back in 2014, while Twitter Lite was launched as a progressive web app just last year. Even Microsoft had announced a lighter version of Skype in February last year.